Wearing daft costumes and waving dripping pans at pub-goers never grows old. Once again, we’ve raised a record-breaking amount of money for charity. 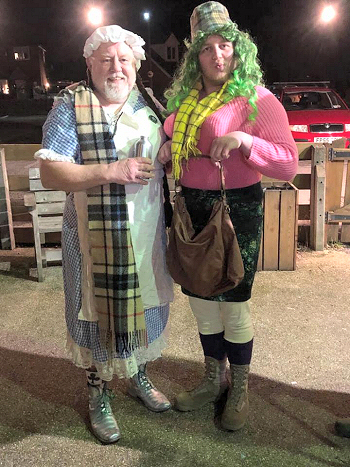 The 2019 Calverton Plough Play saw the good folk of CRAPPPS raise more than a grand (again) for Nottingham NSPCC, with the final barnstorming total from the collection being a whopping £1,349.97. This means that we’ve raised more than £27k for charity since the very first collection in 1979. 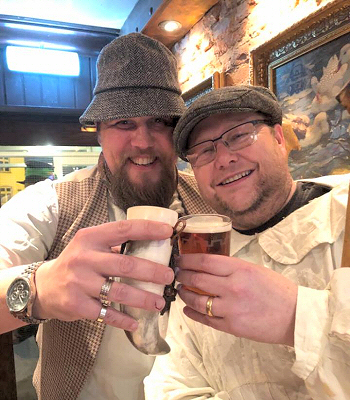 The total includes funds raised from the 17 performance run of the Plough Play on 10 – 12 January and our appearance at Lowdham’s Cider, Perry and Juicing Festival at the end of last year. As a spectacle (Really? You’ll be calling it an ‘art form’ next – Ed.) the play itself continues to evolve, though the words spoken are still largely faithful to the original Cropwell Bishop script of 1890. Duelling Dame Janes (pictured) doubling up to harangue Beelzebub may not have been in the programme back in 1890, mind, but they absolutely delighted audiences in 2019, as did a spontaneously reworked 18th birthday party version of the show for one (un) lucky audience member at The Admiral Rodney at the run’s finale on the Saturday night. Audiences may also have spotted one of the characters undergoing a somewhat historic gender change. A hearty welcome, then, to Hannah Cupitt (daughter of one of the original CRAPPPS founders Michael Cupitt) as one of the Plough Play’s newest acting members, doubling-up with other newbie Kenny Quilty in the role of Threshing Blade. Thank you to the pubs for continuing to plug us so wonderfully and to customers / audience members / hapless victims / delete as applicable for coming out in force to see us. Your hospitality and generosity are, as ever, very much appreciated. We’re planning to be back on the road with our St George’s Play in April – watch this space. Right. Time for a lie down.